"That is exactly the hole we've been looking for, guys," radioed Russian Mission Control outside Moscow. 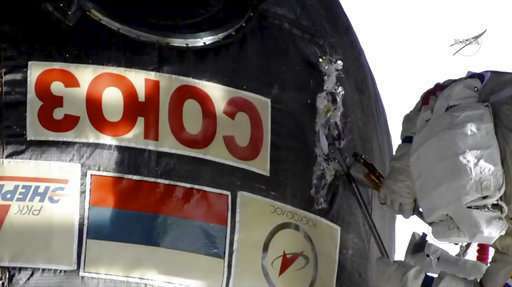 Back in August, the station crew patched the hole in the Soyuz capsule, plugging it with epoxy and gauze. 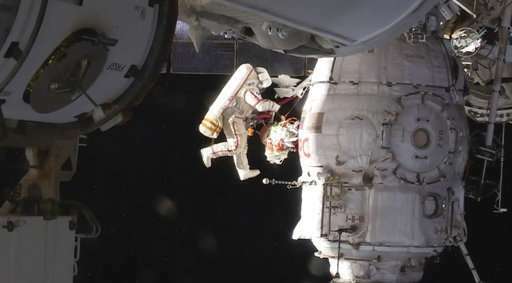 Russian space officials wanted the site surveyed from the outside, before the capsule's return to Earth next week with Prokopyev and two others. Bits of shredded silver insulation floated away like confetti, as the two slashed at it with a knife and long cutters. Mission Control repeatedly urged the spacewalkers to take a few minutes' rest, in their bid to collect samples of the black epoxy sealant protruding from the hole, just one-tenth of an inch (2 millimeters) across. The capsule leak caused a flap between the U.S. and Russian space agencies, following its discovery at the end of August. Russian space chief Dmitry Rogozin observed that the hole could have been drilled during manufacturing—or in orbit. The space station's commander at the time flatly denied any wrongdoing by himself or his crew. The Soyuz is scheduled to depart the orbiting lab on Dec. 19, U.S. time, with Prokopyev, American Serena Aunon-Chancellor and German Alexander Gerst, the station's current skipper. It ferried them up in June.